You can adjust default layout for all pages in Pages section of 5th Avenue options panel. Choose between layout with or without sidebar and standard or fullwidth. If you set layout with sidebar then you can also adjust choose sidebar size. You can also adjust default title area settings for all pages. In addition to the options you have available in the theme options panel, Fifth Avenue theme offers an array of options that are page/post specific. Depending on what post type you’re editing there will be different options available to configure how the page will display. 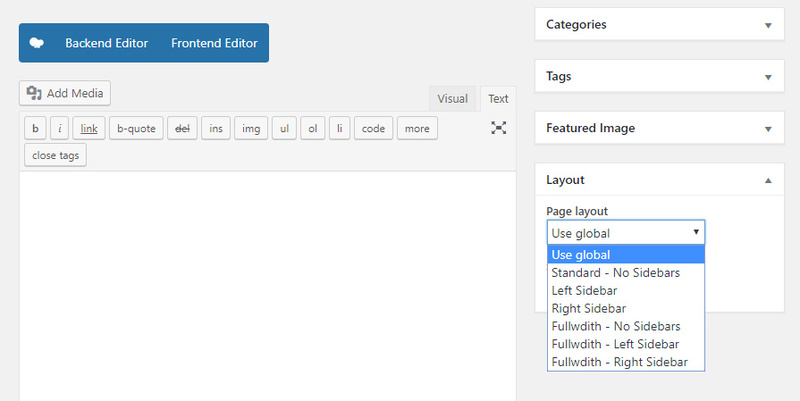 When editing your page/post the options will be located at the bottom under the WordPress editor. Below is an overview on what metaboxes will show depending on the post type. Header White style – enabling this option will change all colors in header to white and will use white logo from Header – Logo section of 5th Avenue options panel. So make sure that you’ve uploaded white logo before enabling this option. This options useful for transparent header on dark background. Force Transparent Header – will place header above content and remove header background. Hide Footer & Hide Copyright Area options will remove footer and copyright area from the page. You can use this options on pages where important attention to content i.e. cart and checkout. We suggest to remove footer area with subscription form from this pages and leave only copyright area. You can choose page layout and sidebar specifically for each page. You can find it in a small metabox on the right bottom side of the post/page editing page. Layout options in metaboxes will override global options.